The Tour de France’s organisers expected a lot from their visit to the Vosges region for this years race and that’s exactly what they got. What the peaks of the Vosges lack in outright height they made up for in drama as the peloton were taken over multiple climbs over the French holiday weekend. The weather that might have been expected in Yorkshire during the opening weekend was firmly entrenched and compounded the riders suffering. Racing for ten days straight including a stage over the Paris Roubaix cobbles had robbed this years edition of the Grand Boucle of two of it’s leading protagonists by the peloton’s first ‘day off’ and left Vicenzo Nibali in pole position. 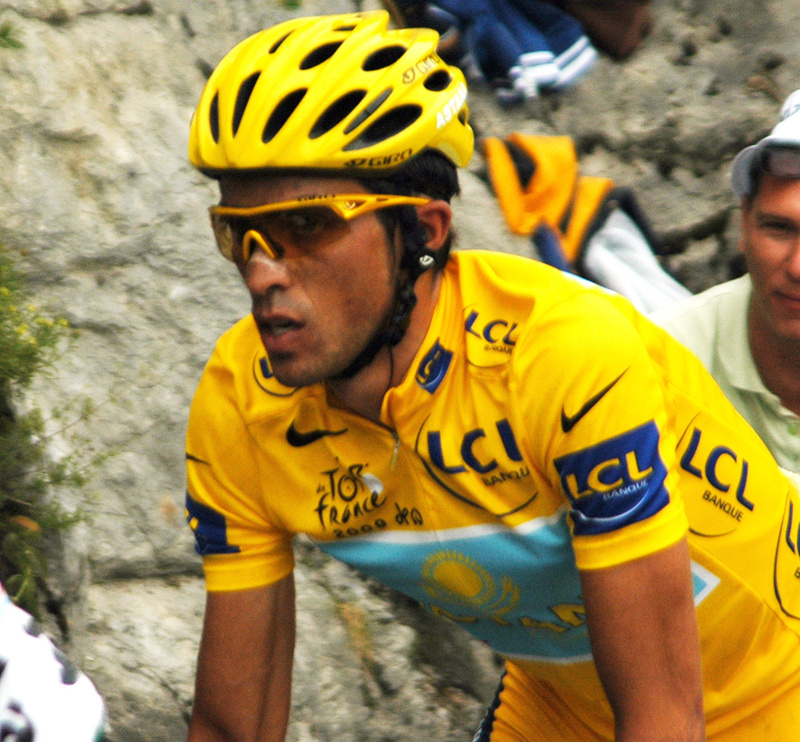 The crash that led to Alberto Contador’s withdrawl during the Bastille Day’s stage 10 took place off camera, such was the fast moving nature of the day that saw the peloton ride into heavy rain as they began the days climbs. In the confusion it was initially suggested that Contador had suffered a catastrophic failure of his Tinkoff Saxo Specialized. The absence of pictures left viewers in the dark as to what had happened to the race favourite until the end of the stage where interviews provided some insight. In the information vacum that proceeded that everyone watching indulged in a little bout of conspiracy theory and speculation wondering if talk of not one, but two crashes was an attempt to paint the riders bike supplier in the best light. The facts, with the benefit of hindsight, are rather more prosaic but have the same tragic outcome for the rider. Contador slipped from the bars while riding downhill one handed with the result that he has suffered a likely season ending knee injury. It’s a testament to the rider and confirmation that road cycling is the worlds toughest sport that Contador actually road 20 kilometres with a fractured tibia before abandoning. We’ll never know if different circumstances would have seen Contador take the fight to his GC rivals on stage 10. He had finished second on Saturday’s stage but was yet take much time back from Nibali. Nibali had relenquished the lead to Lotto’s Tony Gallopin on Sunday, seemingly relaxed enough that he would be able to take it back at will if the status quo was retained time wise with his key competitors. While the final climb (and first summit finish of the race) on Saturday wasn’t a long one, it was steep. Last years winner of Strade Bianche Blel Kadri took the stage and the essential French victory, the only member of the break to stay away. Contador looked the strongest of the GC taking second, but Nibali was with him wheel for wheel. Much as people are now touting Richie Porte as Nibali’s biggest competition in the aftermath of Contador’s exit, he still looks like he doesn’t have the legs. Ultimately if it is a battle between Porte and Nibali it may be decided by the relative strengths of their respective Sky and Astana teammates. In addition to Kadri’s stage win France has strong representation in the top ten with Kadri’s AG2R teammates Roman Bardet & Jean Christophe Peraud, Gallopin and FDJ’s Thibaut Pinot. While Gallopin and Peraud aren’t exactly veterans it’s more heartening to see the strong showing from Bardet and Pinot. Whether Pinot has got over all of his descending fears should become clear when the race enters the Alpes, but Bardet is looking like a strong contender for the young riders prize if not a podium place at this point. The presence of French riders doing well also points to the likelihood that the sport is getting cleaner. While there remain some noises off about riders seeming to come into form unexpectedly the undercurrent is the emergence of some very talented young riders in the peloton across all disciplines. There was speculation from some quarters that Tony Martin, who won stage 9 from a breakaway on Sunday, would have been a possible GC rider during the last decade when doping was rife in the professional ranks. This was less a remark about Martin himself, than his physiology. In some ways Martin was the rider of the weekend as he was responsible for much of the animation on stage 10 too. The way that the Omega Pharma Quick Step rider hit the wall towards the end of the stage demonstrated what should happen when a 85 kilo rider hits a double digit ramp. It feels a lot better to celebrate the way his stage ended than having to watch in disbelief as a muscle bound rider climbed without appearing to breathe with any difficulty. The Tour now enters its second half. The first has served up enoough drama for a three week race already, but such has been the ebb and flow of riders fortunes so far in this race can it be possible that the next 11 stages won’t be just as exciting.